I'm appalled at the measures secular progressives are taking in our nation to remove any semblance of our founding on truth and justice. The forces of darkness want to crush anyone who cherishes life and liberty and upholds biblical principles. Their immediate goals are two-fold: to impeach President Trump and sabotage any challenge to Roe v. Wade, the Supreme Court decision that has resulted in the murder of 60,000,000 babies since 1973. Their strategy is to threaten and intimidate anyone who gets in the way. What we see playing out in America is what the Bible describes as spiritual warfare. The antics of these people are evil. They stand for killing unborn babies, forcing the acceptance of sexual deviancy, attacking law enforcement officers, redistributing wealth, and moving the nation toward a socialist economy. I know this message may sound a bit harder than normal. But the opponents of God have taken off the gloves. The rules of civil engagement have been broken.It is time to do battle to save this greatest nation in history. We are in a spiritual war for the soul of America. As president of AFA, I want you to know that we are on the front lines in this war. Someone once called AFA the Christian version of the Marines. I take that as a compliment. Pray for our champion servants in government. Congressman Chris Smith (R-NJ), an outspoken advocate for the unborn and for religious liberty recently shared how bad the attacks have escalated in the past year. His tires have been slashed eight times. A man has arrested for making death threats against his family. He has a $500k price tag on his head. His opponents have raised $1 million to launch a totally fabricated smear campaign against him. He could easily quit and enjoy a peaceful life, but like many before him, he presses on the protect liberty and justice. Stay informed and active. Email, call or write your congressmen and senators when we issue an alert. Support AFA in this war against those who would dismantle the Judeo-Christian framework of American society and replace it with some form of Godless socialism. A special gift for you. In appreciation for your financial support, the book A Constitution is Born: A Brief History of the Constitution of the United States of America, Tracing the Hand of God, is available this month with our appreciation. The remarkable book was written and compiled by Norma Swanson and Barbara Aud and is dedicated to AFA founder Don Wildmon. 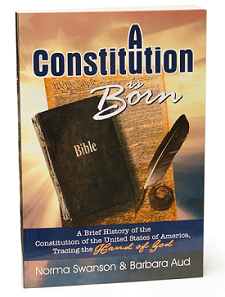 A Constitution is Born is 270 pages of writings, quotes, landmark court decisions, historical documents, fascinating facts, proclamations and prayers - all documenting the hand of God in the founding and preserving of our nation.